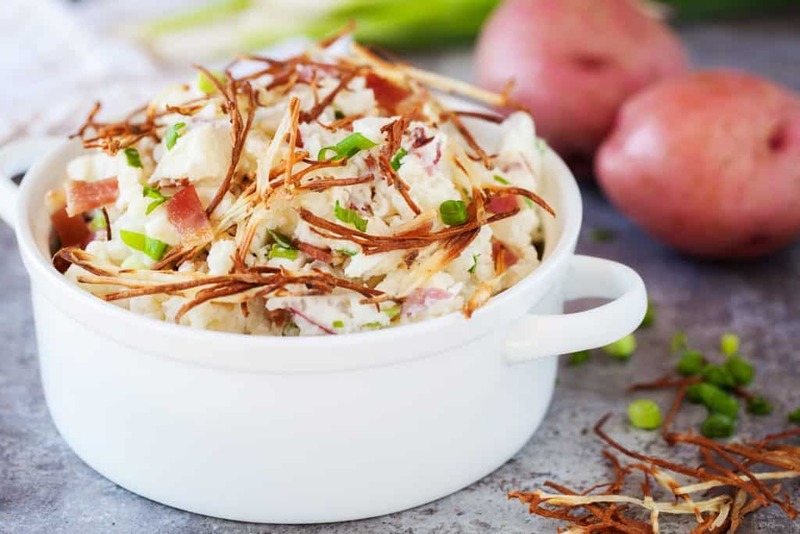 If there ever was a mashed potato recipe that may never see the top of the dining table, these restaurant style smashed potatoes are it! I speak from experience. On multiple occasions, I’ve been known to nearly finish the entire bowl while “seasoning”. Try it and you’ll understand. The bacon and sour cream offers extra indulgence and the shoestring fries offer a delicious crunch. You’ve been warned. 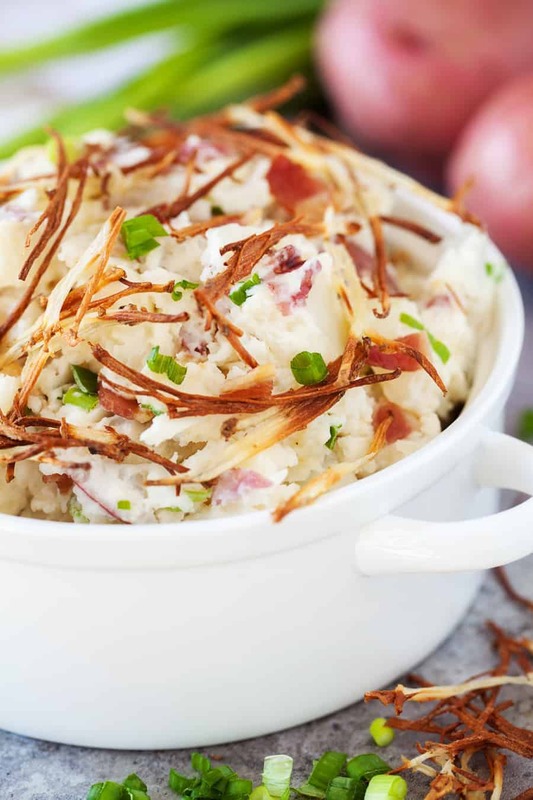 If there ever was a mashed potato recipe that may never see the top of the dining table, these restaurant style smashed potatoes are it! I speak from experience. Gently drop the potatoes into simmering water and cook until fork tender, about 15 to 20 minutes. Remove the potatoes into a large mixing bowl and mash with a potato masher until chunky. 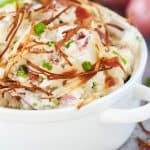 Add the butter, bacon, green onions, and sour cream and continue mashing to combine. Sprinkle in 1/2 cup of shoestring fries and stir to combine. Season with salt and pepper to taste. Transfer to a serving dish and sprinkle on the remaining 1/4 cup of shoestring fries. Serve warm. 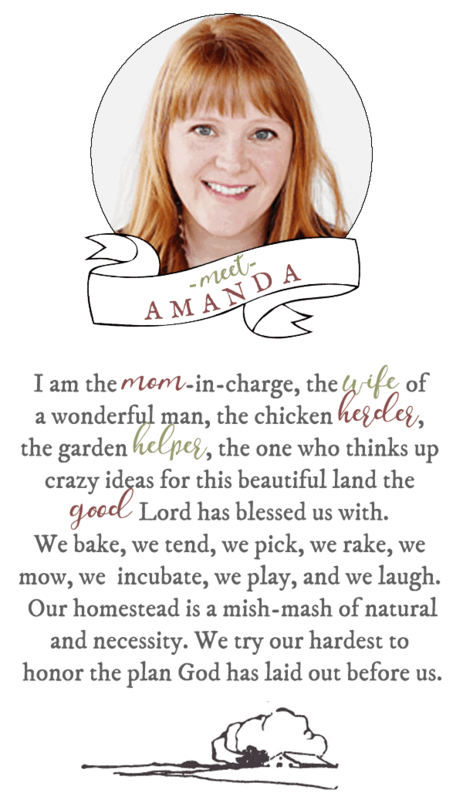 Adapted from The Pioneer Woman. Photography by The PKP Way.